Freund's new photo series plays with the concept of the "signature uniform." When Simon Freund—a conceptual artist living and working in Berlin—debuted his latest project at Munich-based gallery the Stu this summer, he did so during a moment rife with discussion surrounding fashion, identity, gender, and design. That project, a photo series entitled Selbstportrait, portrays 100 different people wearing Freund’s own “signature uniform” and Freund wearing theirs. While Freund initially set out to explore the concept of self-portraiture, the photos of his own clothing ended up playing with some of the most pressing themes in fashion today. His underwear is made by Bloomboxer, a boutique brand that produces made-to-order boxers; his trousers are from Munich-based A Kind Of Guise, an in-the-know label beloved by taste gods everywhere; his sweater is from Leuchtfeuer Strickwaren, one of the manufacturers he used to use for his own label; and the shoes are one of Germany’s best-known fashion exports, Birkenstock. The socks, T-shirt, beanie, and copper bracelet are all pieces Freund produced under his own label. “Uniform” may connote boredom, but Freud’s own aesthetic preferences skew modern, minimalist, and effortlessly stylish. “I was most interested in the idea of making a self-portrait where the person who is portrayed is not even present,” Freund says of Selbstportrait, “so basically making a self-portrait of myself by having other people wear my clothes.” It sounds a little odd, and maybe even a bit vain, until you spend some time scrolling through the website that houses the digitized version of the series. Rows of people, male and female, are outfitted in Freund’s garb and look blankly into the camera: their hands are always in their pockets, the trousers all cuffed in the same manner, and the same knit cap adorns everyone’s heads. Hover the mouse over an image and it switches over to an image of Freund in each subject’s attire: sometimes it’s just a T-shirt and jeans, and other times it’s a dress and stockings. Freund questions our collective desire for individualism through fashion and exploring how clothing has wedged itself within our own personalities. Fashion’s recent obsession with maximalism has meant that sometimes the wearer is consumed by the design. At what point does a garment overtake one’s personality? Is a still photograph more a portrait of the clothes or the person? 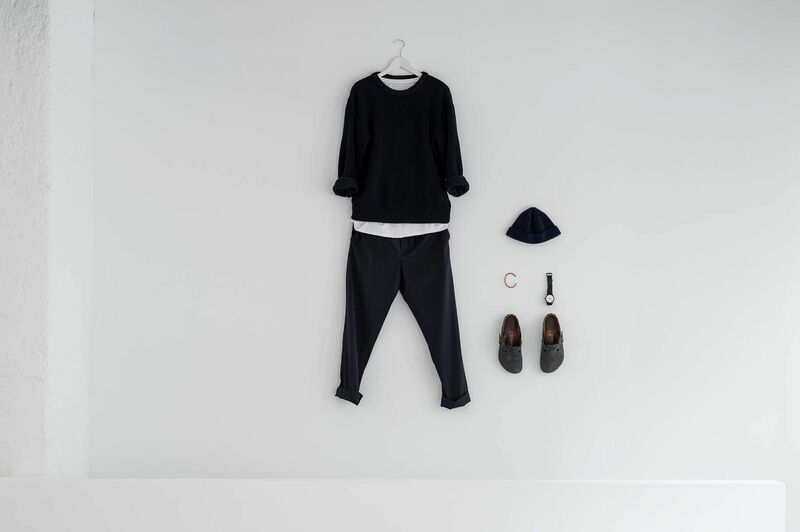 Freund’s concept may skew facile—simply swapping one outfit for the other—but he’s asking us to rethink the power of our own clothing. Whether that means questioning the purpose of your wild Balenciaga sneakers or your simple Gap T-shirt, it’s probably a question worth asking. See a digitized version of Selbstportrait on Simon Freund’s website here .